The Crescent 19 in. 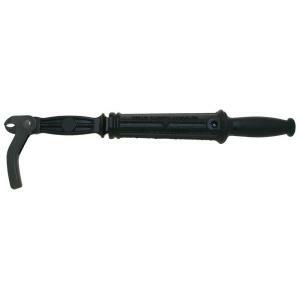 Forged Alloy Nail Puller is a must-have for professionals and homeowners alike for its utility and strength. Built to last, it features a box-joint design with a hardened, tempered jaw and forged alloy construction that handles rough jobsite conditions. Ready to tackle flush nails, the design is available with a long or short jaw and finished in black enamel for extra durability. Tbook.com crawls the web to find the best prices and availability on Nail Pullers and related Tools and Hardware products like Crescent 19 inch Forged Alloy Nail Puller. For this page, related items include products we find that match the following keywords: "Nail Puller" at our vendor partner Home Depot. Crescent 19 inch Forged Alloy Nail Puller is one of 14 Nail Pullers and related products listed in the Tools and Hardware section of Tbook.com If you have any questions on this product, please give us a call at 734-971-1210 during the hours of 9am - 5pm EST for assistance. Thank you for shopping at Tbook.com, the Internet Department Store!